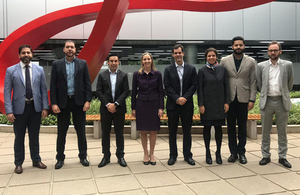 Minister of State for Trade and Export Promotion, Baroness Fairhead, travelled to Brazil and Argentina last week (8-10 April) to meet with key Brazilian and Argentinian businesses and government ministers to discuss the UK’s commitment to trade and investment in both countries and the wider Latin American and Caribbean (LATAC) region. Baroness Fairhead met with businesses across a range of sectors including finance, life sciences and energy to reflect on both the challenges and opportunities available between the countries. Trade with Brazil, the world’s 9th largest economy, increased by 4.7% in 2018, reaching £5.8bn, while UK exports to Argentina rose by 4.1% to £807m. With trade with the two countries at healthy levels, there are significant opportunities for UK businesses to establish and build on strong trading ties far beyond Europe. This visit is a great opportunity to meet with businesses and members of government in both Brazil and Argentina to discuss how we can work together to improve our trading relationship and support more UK firms secure success in the region. Brazil and Argentina are significant markets in their own rights, and while British businesses are seeing increased demand from these vibrant economies, there is still more to do to ensure our leading sectors capitalise on the many opportunities and the growing demand for British brands across both countries. The Department for International Trade is committed to supporting British businesses of all sizes export more and break into new markets, as outlined in the government’s Export Strategy. In Argentina, the Minister met with businesses and government officials to discuss ways in which the two countries can improve market access for business. While in Argentina the Minister highlighted the UK’s capability in a number of sectors including infrastructure, mining, agriculture, energy and financial services. The Minister also co-chaired the fourth meeting of the UK-Argentina Commercial Dialogue. Established in Spring 2017, it is the main forum for bilateral trade discussions between the two nations, and the latest talks focused on addressing market access issues faced by companies trading between the UK and Argentina. The meeting was hosted by Mariano Mayer, Secretary for SMEs and Entrepreneurship, on behalf of the Ministry of Production and Labour. Following the meeting, a new Better Regulation forum was agreed between the UK and Argentine governments, promoting direct regulator-to-regulator exchanges to share best practice and promote regulatory reform. These efforts will assist UK firms to enter the Argentine market, and support the Government of Argentina in its mission to modernise and streamline the Argentine regulatory environment, as well as improve Argentina’s standing as a destination for international business. Minister Fairhead visited Sao Paolo between 9-10 April, to attend an International Green Bond Market event. The Minister gave opening remarks at the event, highlighting the City of London as the global capital for Green Finance and reaffirm the UK government’s commitment to working with Brazil to improve trade and investment flows. The event was followed by a visit to Life Sciences company Aché’s manufacturing plant in Guarulhos to learn more about the Brazilian Life Sciences sector and potential opportunities for further collaboration with the UK. Baroness Fairhead’s visit follows on the back of a week-long LATAC Roadshow across the UK that was promoted by DIT, which aimed to drive more UK businesses to export opportunities in the region. The roadshow engaged with more than 600 companies, visiting five cities in five days. The visit also follows the launch last week of DIT’s a dedicated Latin American Investors Club, created to help support Latin American and Caribbean companies invested in the UK. Roughly 100 investors attended the event. Latin America and the Caribbean combined is equivalent to the world’s third largest economy after China and the USA, offering vast potential for UK businesses across sectors such as food and drink, oil and gas, infrastructure and financial services. Home to over 650 million people, LATAC includes 48 countries and territories with a growing middle-class population, resulting in greater demand for high-quality products and services.